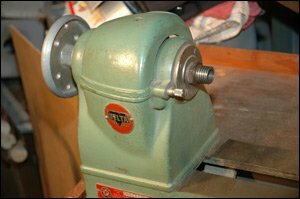 The Delta 1460 Wood Lathe was offered by Delta in two models; a 4-speed version for wood turning and a 16-speed version for wood and light metal work. Pictured here is the one with the counter shaft unit for wood and metal. 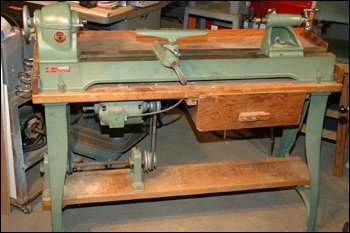 This lathe is rigid and accurate and appears to the the perfect lathe for general wood working applications. By adding the counter shaft unit, the 4-speed model can be converted into an efficient, accurate 16-speed lathe for light metal turning. And with the addition of the compound slide rest, practically everything except screw cutting can be done. The slower speeds are ideal for large face plate turning of woods, the faster speeds, for sanding, polishing and finishing all types of materials. The complete versatility of the Delta 1460 Wood Lathe, plus its many built-in features make it a nice choice for the home workshop. The basic machine without the stand included the No. 1461, tool support base, the No. 690 4" tool support, No. 692 12" tool support, No. 933 drive center, No. 934 cup center, No. 936 3" face plate, no. 644 66 1/4" OC V-belt and wrenches, but not motor, motor pulley, switch rod, or bench. With the addition of the No. 1463 Cast Iron stand, it has the necessary weight to avoid vibration. The Delta Model No. 46-305 included the No. 1460 basic machine plus the No. 932 4-step motor pulley, and No. 1463 Cast Iron Lathe Bench. Delta Model No. 46-310 which is pictured here, included the basic No. 1460 Lathe with the No. 932 4-step motor pulley, No. 1463 Cast Iron Lathe Bench, and No. 1464 countershaft assembly for 16-speed operation. 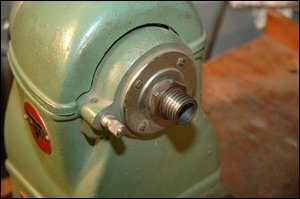 In 1956 the Delta 1460 Wood Lathe also offered all-inclusive catalog numbers that included the motors and pulleys. Catalog No. 46-311 included the basic 1460 lathe with the stand and the No. 82-710 1/2 H.P. motor. Catalog No. 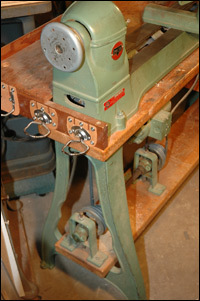 46-321 included the 16-speed lathe with the stand and the motor. 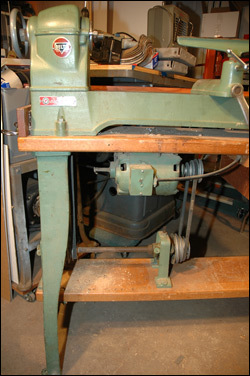 Delta offered several features that made this a popular choice for wood lathes. 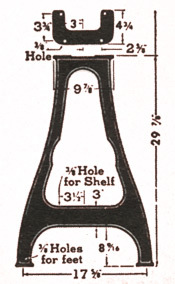 Indexing Mechanism - provided two roles of holes in the headstock pulley. Eight holes and 60 holes could be engaged by the indexing pin so that you could obtain the maximum number of index divisions. The Cast Iron Tailstock was made of substantial, fine-grained cast iron. It included a provision for set-over of the tailstock for center alignment and taper turning. The tailstock locked to the bed with a wrench conveniently located at the front. Universal Tool Support - is exceptionally handy and fast in action. It's heavy and substantial and locks to the bed at any position or angle with a convenient lever a the front where it does not interfere with the work. Massive Lathe Bed is made of fine grained cast iron heavily ribbed to provide the greatest rigidity and accuracy. It's a full 53 1/2" long, 8 1/2" wide, and 4 7/8" high. The finely machines ways are 2" wide in front and back. 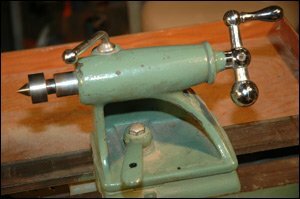 Graduate Tailstock Sleeve - The graduated tail stock is operated by a large ball crank handle and locked in place with the convenient ball end lever on top of the tailstock. The sleeve is machined for a No. 2 Morse Taper centers. 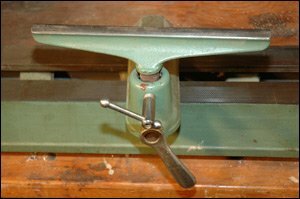 Safety Headstock - Unlike the lighter 11" Homecraft version, the Delta 1460 Lathe includes a headstock that completely encloses the pulley and belt from the front and top of the lathe. The belt drive can be taken from either the bottom or rear of the machine. If you have a copy of the owners manual for this lathe, please share it, and we'll make it available to visitors. No. 62-610 1/2 H.P. Motor. Capacitor start, 115v., 1725 r.p.m., 1/2" diameter single shaft, ball bearing. With switch, cord and plug. This stand included the No. 945 Cast Iron Bench Legs for 12" standard lathes. Made of solid, heavy cast iron, they prevent bench twist. They have brackets for a bottom shelf. These measurements are: 9 7/8" wide at the top, 17 5/16" wide at the base, and 29 7/16" high.